Who is interested in seeing this finished? For starters I will be happy if I am able to make an outside hull version. But it would be fun to later make a version where you could lift off the top with interior. Looks good, but isn't it a bit small? I don't know where they got dimensions, but I've seen a couple MF projects done at 1/144 and another at 1/100, and it doesn't look much larger than the 1/100 one I've seen. Not that I'm normally a dimensions guy. I am usually a 'that looks about right' sort. Which is why I am not a good plumber, maybe. Why not start with the interiors? If you worked from the middle out you could fudge the exterior to cover any of the compromises you had to make as you went along. It would save you work in the long run and the interiors would look cool on their own. The tiny model I have for reference is 1/164 and is about 21cm long. I have done some research and the 1/72 model is about 43cm long, the "de Agostini" (supposedly 1/48 scale) is 81cm long. My version is roughly extrapolated from this image from Amazon and is 57cm long. It might not be perfect scale but I think the size should be a good match for mini size and managing parts on A4/Letter size pages. cowboyleland : That's a good idea for the interior version. I'll start with some crude test builds anyway so the "just hull" version will probably develop without the interior for now My plan is to make the hull first because I think it will be easier. Once I have the experience of the first model I will try 2nd level model with interiors! bluecloud2k2: What are grommets? My google gives me shoe parts?!? Was this already linked to? That one is my favorite of the existing models. Most of the models are either WAY too small, or WAY too detailed. I have started building that one a couple of days ago but I wanted to make a better one. Bigger and matching the size of minis. I have seen a handful of crazy details ones. Like movie replica standard. I just want something that looks good, can be built reasonably easy and is playable. Disney usually has no problem with 'fan art' if you aren't making money off it and it doesn't go head-to-head with something they are selling. bluecloud2k2 : What are grommets? My google gives me shoe parts?!? I found Slaweks Falcon today. The download seems to be for A2 paper size. Seems about the right size! I did a little more research ... again. So when I use that blue image for reference I get a Falcon with a length of apx 56cm. 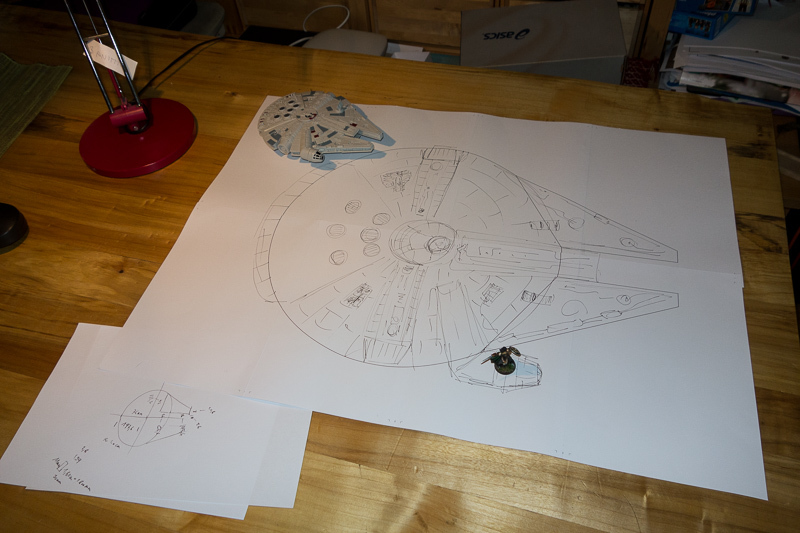 That is about the length of my U-Wing (for 30mm figs). 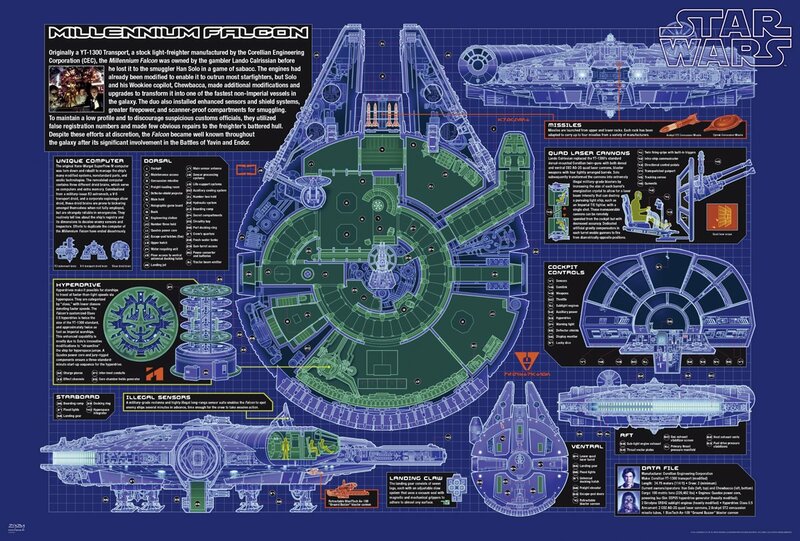 According to Star Wars websites the length of the U-Wing is 24m, the Falcon 34m. So by this my Falcon should be apx 77cm. I think it should be bigger than the U-Wing, if not by much. Anyway, just to let you know this hasn't died yet. Great find! Thanks. Except want mine to be much bigger! :-) We'll see how this goes! 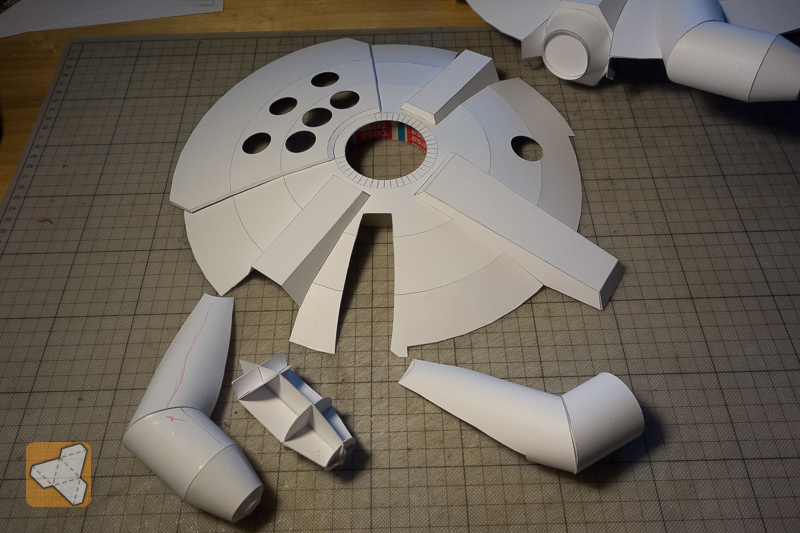 I have a smaller Star Wars garbage scow I am working on. 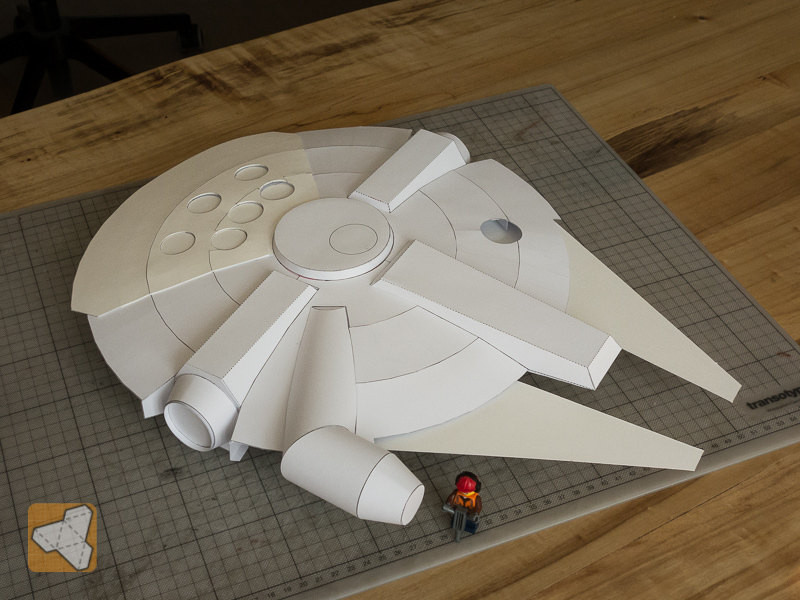 You should already complete "not star wars" paper minis set. With my struggles at the orc huts I am spending my time on other projects now, until the creative juices are coming back to the savages ... so this is one thing I have been working on and off last week. Got the basic mesh done and started a first try at an actual build. It is an advanced proof of concept, just trying things out and seeing how it can be improved. The biggest challenge at this level is dealing with tolerances but I think I can add "control" parts that will help make it look good without too much fidgeting. Due to some scaling troubles this build is not my intended one. I want it to be the same scales as the U-Wing (15 and 30mm figures). This build reduced by 85% would then be the 15mm version. That brings the question. When this is finished, is it going to have the classic round reflector dish or the new fancy square one? It will def have the original round one. But an alternative part should be the least of challenges! BTW that is where I am now. I have redone the hull. With cutfiles it comes together so precise! It now is in proper scale for 15mm figures. 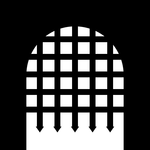 I hope to make it so that it all will be vectorized so you could simply print it on A3 or even A0 paper and built it for your 30mm, lego mini figs, playmobil figures etc. Stuck with the cockpit arm. The bend connection is giving me headaches. I am trying to make it come together without any possibility of errors but so far it has remained a challenge. That is looking good so far! Hope to see it finished! What are those minis from?